He was technically correct too, what hit the north of France and the UK on the night of the 15th & 16th of October in 1987 was a violent extratropical cyclone, in fact, post analysis of the way that the storm rapidly developed means that nowadays it would be classified as a weather bomb. Regardless of what it is called, the winds were hurricane force, gusting over 100mph with a peak of 120mph in Shoreham on Sea and then it broke the anemometer. Over the period of one hour, the sustained wind speed was recorded at 75mph. The last time a storm like this had hit the UK was 300 years ago. The devastation though was immense. Caravan parks were trashed, cars crushed, homes lost roofs, roads and railway lines were blocked, power lines failed and 22 people lost their lives. That night too fifteen million trees were flattened, Kew Gardens lost historic specimens, the grand gardens of the National Trust were equally devastated and six of the seven oaks in Sevenoaks were lost. A ferry was blown ashore and another cargo ship capsized. It reached the point where the people at the National Grid made the decision to shut down the grid to stop catastrophic damage to the power network. The thing is though, I slept through the whole storm that night! I woke up to carnage the following morning and can still remember how long it took to get to work in the morning, passing fallen trees, doubling back because of roads being closed and seeing one home with a tree that had fallen onto it. Memories of this Great Storm were bought back to Tamsin Treverton Jones after she found a photograph of a mural that her late father had designed and was carved using wood from Kew Gardens by an incredibly talented sculptor called Robert Games who carved it at the startlingly young age of 16. This mural still hangs at Kew and starts the process of tracing the woodcarver to find out what had happened to him after producing this artwork. Going through the motions of finding Games, opens a series of other questions about the people and place that were affected that night, prompting her to visit orchards, grand gardens to see the recovery that they have had since and to discover what they have learnt for the next storm. 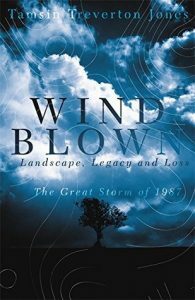 I can’t believe it is now over thirty years since this storm happened, I also remember heading out the weekend after to go mountain biking in the hills around Leith Hill in Surrey. We did get some cycling in, but there were an awful lot of trees to clamber over carrying a heavy bike. Treverton Jones’ own journey through the places and memories of her past is written with a wistful melancholy. She remembers the legacy of her late father Terry Thomas and travels around the country to meet with the families and friends of those who were tragically killed in the storm. There are positives too, at Kew and other large gardens she learns about the new techniques that they have developed in managing trees and woodlands to make them far more resilient when the next storm hits. When you remember the images of the flattened woodlands and majestic trees in parks in the days after, the changes since then have been quite dramatic. Oh, wow – I think I need this book. I lived near Sevenoaks at the time and it was absolutely terrifying – our apple tree feel down and proved to be the same height as its distance from the house, and a tile came off our roof and you could feel the wind tugging, tugging. A neighbour had their neck broken by a tree falling on their car (they recovered!) and our village was cut off for a few days.